Having relieved the British 49th Infantry Division on 23-25 October, 1944, in the vicinity of Wuustwezel and Loenhout, Belgium, the 104th Division began it's push into Holland on 25 October. Liberating the towns of Zundert, Achtmaal, Rijsbergen, Etten, Leur, Sprundel, Oudenbosch, Standaarbuiten, Kreek, Zevenbergen, Noordhoek, Klundert and Moerdijk, the Timberwolves soon reached the banks of the Maas River and concluded its Holland campaign. After release by the First Canadian Army, on 5 November the First United States Army directed the Division to move to Aachen, Germany, commencing on 6 Nov. While the 414th Regimental Combat Team held its position at Moerdijk, the balance of the Division completed the move to Germany and started its relief of the U.S.1st Infantry Division in the vicinity of Aachen on 8 November, joining the VII Corps, First Army. On 16 November, following the biggest air assault of World War II (2,400 bombers), the Division, from its positions in the Aachen-Verlantenheide area, launched an assault on the pill boxes and other fortifications of the Siegfried Line and clawed it's way past Hill 287 and through the heavily defended fortress towns and cities of Stolberg, Rohe, Helrath, Durwiz, Eschweiler, Putzlohn, Volkenrath, Weisweiler, Frenz, Lamersdorf, Inden, and Merken to the banks of the Roer River opposite Duren. German radio broadcasts called it the "most terrible and ferocious battle in the history of all wars" and The Stars & Stripes described the German shelling of Inden as "the heaviest artillery concentration ever experienced by American troops" when the Timberwolves battled for the Inden area. Time Magazine stated, "The Germans fought like wild men for the Inde" as the 104th conquered Lamersdorf, Inden and Lucherberg. The strong German offensive, launched the morning of 16 December, became known as the "Ardennes Offensive" or "Battle of the Bulge" and the 104th was directed to prepare an all-out defense of its sector. 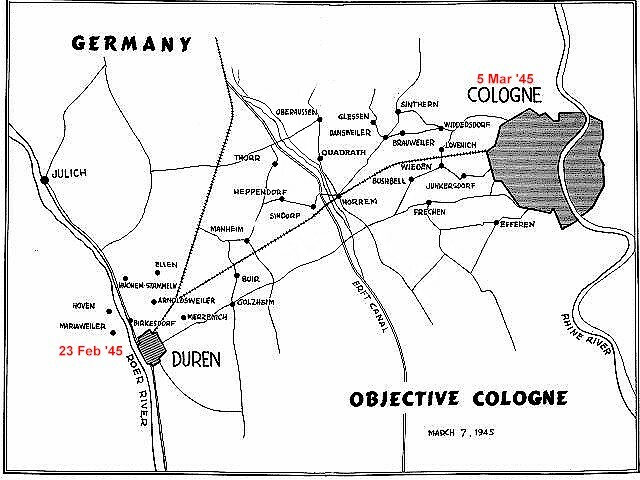 This delayed the planned crossing of the Roer until 0330 hours, 23 February when the major offensive action to reach Cologne was begun...the Rhine was reached on 7 March & "Cologne, the Rhine's greatest city, is ours." Time Magazine reported, "The Germans fought for the Roer River, between Aachen and Cologne, as if it were the Meuse, the Marne, and the Somme of the last war all rolled into one." Crossing the Rhine at Remagen, the Division supported the 3rd Armored Division, (VII Corps, First Army) and started a major offensive action on 25 March that was to cover a 193-mile dash to Paderborn in 9 days. This link-up with the U.S. Ninth Army at Lippstadt completed the encirclement of the Ruhr Pocket to trap 335,000 German troops. The final leg of the journey took the Timberwolves across the Weser River, with Dunderstadt, Bad Lauterberg, Nordhausen, and the Harz Mountains along the route to the Saale River and Halle, then on to the Mulde River for a sweep of over 350 miles in less than a month and contact with the Russians on 26 April.